Using only the finest ingredients, we pride ourselves in staying true to the traditional English style of brewing with a focus on balance. We currently offer 8 bottled styles, with 12 taps in house featuring a rotating selection of house brewed specialty beers. Not your typical West Coast IPA. This is a traditional style that some might call old school - but we call perfectly balanced. It’s brewed using all imported English malts with a blend of Cascade and Columbus hops for a proper balance of all the things. Named in homage to Moonstone Beach, a local treasure here in Humboldt County. 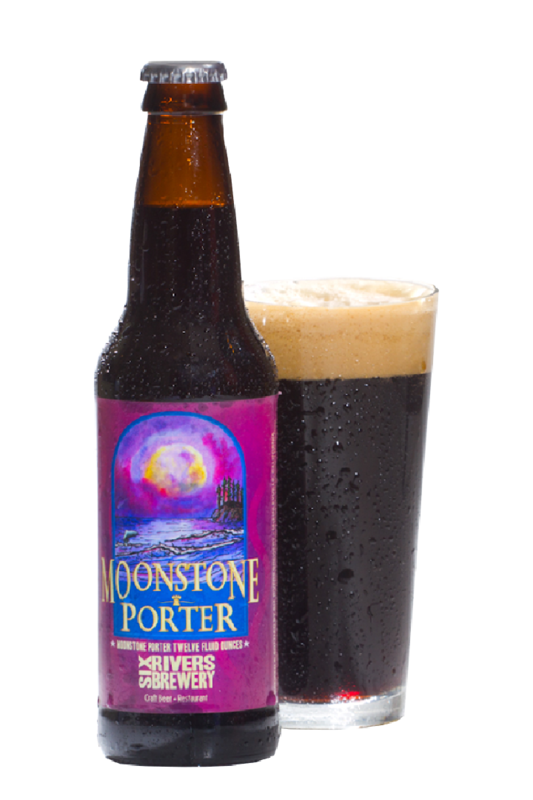 A robust Porter, deep mahogany in color, brewed with all imported English malts, and a combination of Northern Brewer and Willamette Hops. Our Bluff Creek Pale Ale has made it’s triumphant return! This crisp refreshing ale has an updated flavor profile featuring Citra hops. Brilliantly golden in color and highly aromatic, this light ale a perfect go to for any occasion. Tap to check-in on Untappd! of macadamia, plus a wicked smooth finish. Legendary, like the beast itself! English style Double IPA, loaded with Pacific NW, Cascade and Columbus hops to a whopping 99 IBU then perfectly balanced with our mix of all imported malts. Six Rivers Brewery only uses whole hop cones, never pelletized! A Crisp American Wheat Ale infused with Brewmaster Carlos' special blend of fresh and fire roasted chiles for some serious burn. Also makes a great mixer for beer cocktails or marinade for your favorite meats. Named after an adorable, lazy pit bull terrier, this American style Wheat Ale is fermented with over 400lbs of real strawberries for a light refreshing Summer treat! A Belgian Dubbel fermented with 480lbs of whole raspberries, Belgian Ale Yeast, Belgian candi sugar, Hallertauer Hops, and Oak chips. Deep red in color with a powerful raspberry punch. Brewery Tours - We invite you to visit anytime! Come tour the facilities, have a beer and experience the "bella vista" that gave us the nickname: "the brew with a view." Our Cicerone-trained staff (the beer equivalent of sommeliers) love to suggest pairings, educate you on our wide variety of craft beers and make sure you have a great time! See why we have been crowned Humboldt County's top picks at Hops in Humboldt year after year. With our gleaming wooden bar, rocking music and delicious brews and food, we invite you to kick back, realize your own dreams and make a lifetime of memories.